Destination of the day: Half Moon Bay. We started with a Bart ride from Rock Ridge to Daly City. Although bikes are allowed on Bart, two giant bikes take up a lot of space and we didn’t want to be rude. We waited until commute hours had passed, to avoid loading two giant tandems on trains crowded with commuters. Good plan! Bart was mostly empty mid-day and the trip ended up being stress-free and uneventful. We left Rock Ridge in the sun and arrived in Daly City enveloped in a blanket of dense fog. The weather in the Bay Area varies so widely! 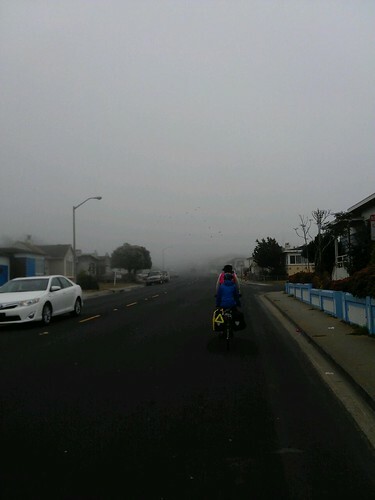 We donned our shells and warmer clothes, turned on our lights and headed through the side streets of Daly City. Half Moon Bay was a short 22 mile ride from Daly City, a perfect distance after so many rest days. Tim’s knees have been hurting after the three-day, 200 mile ride from Seattle to Portland. He’s also still nursing a pretty nasty cold. A short day was all we could take. Our friends from Seattle, whom we met on our 2012 Pacific Coast Tour, warned us about a climb and tunnel just outside of Daly City. On their ride from San Francisco to Half Moon Bay in July 2012, they were run off the road by an impatient commuter and ended up in the ditch. I was dreading this section of road and was not happy to be riding it in dense fog. Thankfully it was early enough in the day that traffic was not too bad. The climb went by fast and before we knew it, we were through the tunnel. The rest of the ride was easy and we took it slow as Tim’s knees kept him from riding too hard. We arrived at the campground in the late afternoon. Tim went to check out the hiker biker while I rode up to the booth to find out about campsites. Tim and the girl rode up as I was talking to the ranger about available sites. They had just received two cancellations and had two $35 car/RV sites or we could pay $7 per person for hiker/biker. Tim reported that the hiker/biker site was inhabited by ax-swinging meth looking dudes who looked like they were fresh out of a scene from The Road. Our daughter was shaken by the sight of them and they both reported that there was no way we were sleeping next to them. An extra $7 was worth it for a car site. Done. After we secured our site, we rode into town for dinner. After some yummy local Mexican food, we came back, set up our tent and settled in for the night. Just as we were getting ready to get in the tent, the fog lifted and we watched the most beautiful sunset! 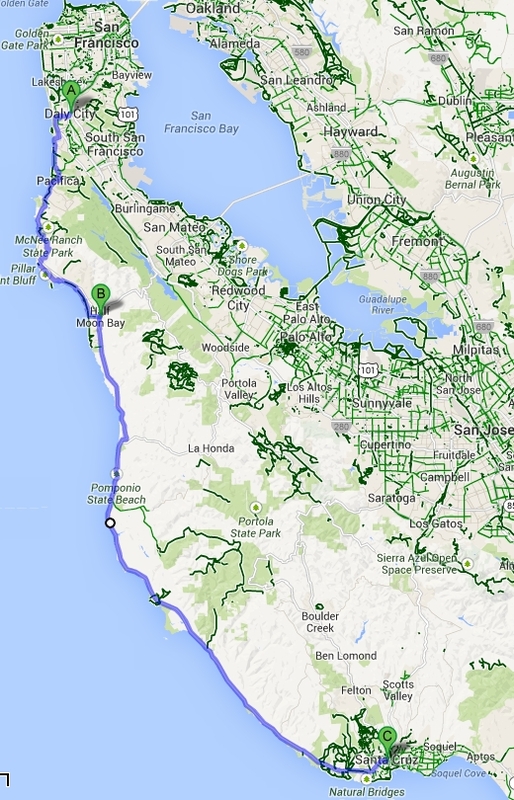 Route: Ride to Bart, Bart to Daly City, Skyline Dr through Daly City and Pacifica, and Hwy 1 to Half Moon Bay. High: Bart with tandems super easy! Low: Tim’s knees are super sore and he’s wondering if he can make it all the way to Tijuana. We ate breakfast in the campsite and packed up pretty quickly. Tim wasn’t sure how long it would take us to ride to Santa Cruz with his sore knees and wanted to allow plenty of time. Aided by an epic tailwind, we pedaled along Hwy 1 at over 22 miles an hour. Nothing like going 14 mph up climbs! The ride was absolutely beautiful. And we arrived in Santa Cruz with plenty of time to enjoy a local bakery that our buddy, Chris, recommended, visit the Patagonia outlet and get Tim some new wool pants at Goodwill. 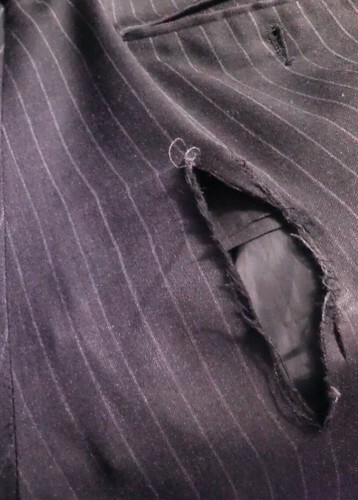 His favorite pinstripe wool pants blew out on the way to Half Moon Bay and he didn’t want to moon everyone the rest of the way down the Coast. We opted for a hotel in Santa Cruz. Thinking we might go check out the Boardwalk and take advantage of $1 rides a local woman told us about. Once in the hotel room, we were all too tired to venture out. The Boardwalk will have to wait for another trip! Low: After spending the afternoon in Santa Cruz, Anne got stressed out and was mean to everyone. This entry was posted in bike touring, bikes, Pacific Coast Bike Tour and tagged "family bike tour", CA, carfreedays, Pacific Coast Bike Tour, tandem bike tour. Bookmark the permalink. You are all very inspiring! I bike commute and ride with my family often. We met up today at Trader Joes in San Luis Obispo. I can bring you that extra S-A saddle, if you can call me. check your email. So inspiring to read of your adventures, keep it up! A little Jack Daniel’s should fix Tim’s knees and Anne’s stress. . . I saw some beautiful photos on flickr and knew it was time to see what was happening on carfreedays. We used to live in La Honda, SE of Half Moon Bay. I miss biking through those rolling hills. But it was a half hour to the nearest store, so it is probably where I did the most driving in my life as well. Happy biking you guys!